As many of you will know, I manage the Ubuntu Community team at Canonical where Daniel Holbach, Jorge Castro and David Planella work. Together we strive to make the Ubuntu community a fun, productive and engaging environment. This work involves a tremendous range of diverse disciplines and projects. One thing that we have been really keen to facilitate in Ubuntu is an ethos of just do it. I really believe our community should feel engaged to be creative in their ideas and be able to get out there and do it, with plenty of support resources so others can help them achieve their goals. I am keen that we don’t have a bottleneck where creativity is limited. Of course, this happens from time to time, but we are always keen to resolve it where possible. While Ubuntu has a great many projects going on at any one time, some of these projects I explicitly put on my radar so I can help contribute to make them successful, and some of these are projects that I have been happy for me and my team to commit their time to. Each of these projects is scoped for a six month cycle, and when we get a little closer to the 10.10 cycle we will start thinking of where we will focus our time in that cycle too. We first had a series of discussions at both UDS and online in which we discuss each project, what is involved and what targets and goals are in scope for the Lucid cycle. Targets beyond the Lucid cycle were explicitly deferred until the 10.10 cycle. The conclusions generated from these discussions were first documented as a Roadmap on the Ubuntu wiki. This provides a high-level set of goals that the project is striving for. We then produced a Blueprint for each project and a set of actions that are assigned to people. The blueprint is what we use to track progress on the project. The actions are stored in the whiteboard on the blueprint (which anyone can edit) and anyone can subscribe to the blueprint, which makes it great for keeping on track projects even if you are not involved in them. In the above example, it clearly states who the action is assigned to (jonobacon on Launchpad), what it is (an example action) and it’s status (TODO). When an action is completed it is set to DONE and if we decide we want to bump it to next cycle, it is marked as POSTPONED. Commitments to a given project are clearly scoped to a cycle. Work is assigned to people: this is a great way of getting things done. Project Management theory has long taught that publicly assigning work to people improves it’s chances of getting done. Transparent: anyone can subscribe to a blueprint. As an example, even though I am not managing the Desktop Experience team or contributing to their projects, I am interested in their work, so I subscribe to a number of their blueprints. Each time the state of an action changes, I then get an automated email with the update. This is great for keeping up to date with their work. With a bunch of blueprints that follow this format, I then approve a number of them as projects that my team will help have oversight on and help them to succeed. Some of these projects are driven by my team and I, but many of them are entirely community driven projects that I assign my team to have oversight over. It works like this: the Y axis is the number of actions in the blueprints I have approved for my team, and the X axis is the time until the end of the cycle (it is a little shorter as the graph was regenerated). The thick line through the middle of the chart is the trend line. My responsibility as a manager is to help keep the number of completed actions (shown as green) under the trend line: this ensures that we are on track for completing the committed actions throughout the cycle. This was a pretty new concept for our community and of course the community is not expected to follow this way of working, but I have been stunned at how everyone has worked hard to stick to the actions they committed to and see the work through. As such this has felt like a really great cycle with some stunning work going on. Thanks everyone for your contributions! [Author] action title: PROGRESS I had no idea that this was the convention used with blueprints. It would be amazing if this list of tasks could be implemented properly with Launchpad. So where’s the blueprint that was used engage with the community about putting the close-button of windows at a non-fixed position in neither corner? You can spin all you what. The transparent parts of Ubuntu are not that much used. Just today, I read on the ubuntu planet that there are more than 1600 bugs out there with patches attached. The transparency and user-participation is becoming more and more a farce. It’s all interesting infrastructure that may someday help a real community powered distrobution. But to call Ubuntu community powered .. i used to believe that, and that that was the actual intent. Nowadays it just feels like empty words. From the box of random revelations: Nobody uses evolution. Just a guess, but I think webmail takes at least 80%, with thunderbird taking almost all of the remaining 20% of users. The package that enabled proper gmail integration is still living in the new queue and will likely not be part of the LTS. (if it will be part of Ubuntu ever). Thunderbird is still not installed by default, but rather evolution is. Look at that. A rant. And it isn’t even about the window buttons. Hey, talk about themes, how about starting with the important reality check that most people use both KDE and GNOME applications? That a priority for a theme, should be to make the applications look uniformly. It’s not your fault though, Jono. It’s your job, and Ubuntu has the momentum to establish opensource in mainstream usage in an unprecedented way. We share the same dreams. But perhaps, even as a community manager, there should come a point, where you have to turn around and start to manage the obstructions of community participation, because they don’t lie with the community. It’s just such a waste of an opportunity. We don’t have a Blueprint about every decision made in Ubuntu. Also, button placement has nothing to do with my team: my team is the community team, not the design team. Indeed, and why do you think we made the patch view? It is because we are keen to have better visibility on these contributions to take them through. Every cycle I summarize the most popular proposals and ask all of the engineering managers to weigh in on them and propose them to their teams. This was the intended purpose: it provides a means of gathering opinion, it has never been a commitment to implementing anything on there. Ubuntu is an Open Source project: have you contributed to any implementation on those ideas? We never say we are “community powered”, but we are disto that has a strong community in and around it. 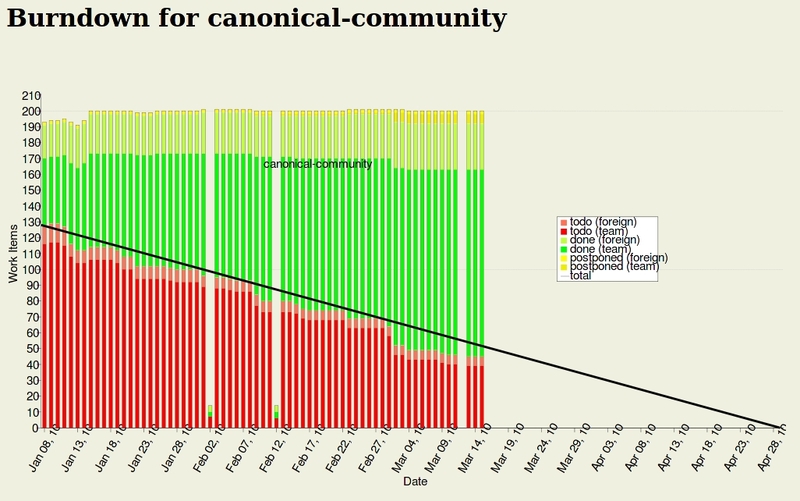 Just because Canonical invests in it doesn’t mean it is not heavily community influenced. Also, given that we have open and transparent governance, open blueprinting, open resources and fund many community members to our developer summit, it seems like you are seeing the part of the picture you want to see. What data do you have to substantiate this? When you say webmail, are you suggesting we remove Evolution and only provide access to Gmail or another webmail component? I am not sure about this: have you spoken to the desktop team to see what is blocking it? Why don’t you write a spec to propose a shift to thunderbird and talk to the desktop team about it? Why do you assume that I or others should solve this problem? Ubuntu is an Open Source distro: there is every opportunity to contribute and solve this problem. Have you looked into being part of the solution for this? It’s not your fault though, Jono. It’s your job, and Ubuntu has the momentum to establish opensource in mainstream usage in an unprecedented way. We share the same dreams. But perhaps, even as a community manager, there should come a point, where you have to turn around and start to manage the obstructions of community participation, because they don’t lie with the community. LOL, you don’t think that a significant part of my role is in trying to make participation in Ubuntu easier? Me, my team at Canonical and many of our community members are all working hard to do this across a range of topics and disciplines. I am not denying we have problems to solve, but here you have just provided a rambly rant about your issues with Ubuntu: why don’t we instead work together on solutions? I would love you to drop me an email to jono AT ubuntu DOT com where we can talk more. i love your work at ubuntu jono! keep it up! i wonder why can’t people concentrate on problems but on telling people who are working hard to put things together in this great project.